Charles B. 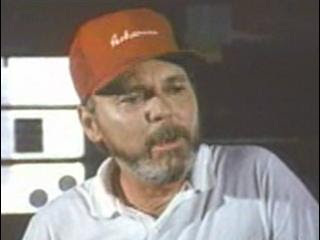 Pierce, the director of my favorite bad movie of all time, Boggy Creek 2, died today. The man was never known as a great director. He was best known for the 1972 documentary, The Legend of Boggy Creek, which investigated bigfoot sightings in a small Louisiana town, but was made infamous by Mystery Science Theater 3000 for their popular lampooning of its fictional 1985 sequel, Boggy Creek 2, in which he also starred. With its laughably amateurish performances, stilted dialogue, and altogether bad filmmaking (it's painfully obvious many of the nighttime scenes were filmed in the daytime, and slightly darkened in post), Boggy Creek 2 was a perfect target for MST3K's brand of scornful commentary. 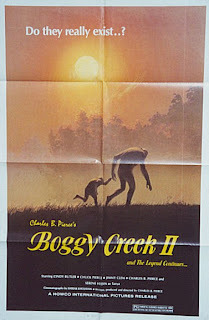 And while I fully acknowledge its failures, Boggy Creek 2 scared the ever loving daylights out of me as a kid. I rented it from a local video store with my grandfather when I was around 8 years old, and the film terrified me like nothing else ever had. Even revisiting the film today, I am amazed that a film this poorly made manages to include some genuine scares. Maybe it stems from my fright as a child, or my lifelong fascination with the bigfoot legend, but damn it if Pierce doesn't conjure up one of the most eerie takes on the creature I have ever seen; the film's amateurish aesthetic almost adds a disquieting degree of realism (if you ignore the dialogue and performances, that is). I even gave a nod to the film in my performance in my university's production of Inherit the Wind last year, in which I played multiple roles, including jury foreman George Sillers and the villainous Reverend Brown. In it, defense lawyer Drummond was cast as a woman, and those of us playing jury members were directed to react when she took off her coat. And every night of the show, in a wink to Boggy Creek 2's most famous character, Old Man Crenshaw, I would say to the person next to me "that sure is a man's kinda woman!" It never failed to get a laugh from the audience, and I can only give my thanks to Pierce and the man who brought Crenshaw to life, Jimmy Clem. I'll never forget all the sleepless nights, the wayward glances toward dark forests, and the overall sense of dread Boggy Creek 2 gave me. It's funny, the movies that have the most impact on us. It's not always the great ones we will never forget. It's not even always the good ones. Sometimes the bad ones leave just as big of an impression, and not always for the worst. Rest in peace Charles. And thanks for the memories.